Both of us have been very happy with our packs until Kyle began to loose weight. Unfortunately Boreas is a very small company and their sizing options are somewhat limited; they were unable to offer Kyle a smaller hip belt option. He was forced to switch packs and ordered the male version of my pack. He has had some small complaints with the Granite Gear but really he is just bitter about having to switch. We made good decisions when it came to our footwear. We have seen terrible things out here, last night I watched our friend Bogie pull off yet another toenail. We’ve seen blisters the size of eggs, feet covered in bandages, cracks, calluses, swelling, bruising, and wet pruney skin. When Kyle and I unveil our feet people gape in wonderment. We are religious about lotioning, gold bonding, massaging, and soaking our feet but really we have our shoes to thank. Of course our feet hurt after eighteen miles but whose don’t? Our feet stay dry after hours of rain, we haven’t had a single blister yet, and neither of us has had any feet related injuries. The main thing we have learned is do your research, try on different shoes, and invest in your footwear. 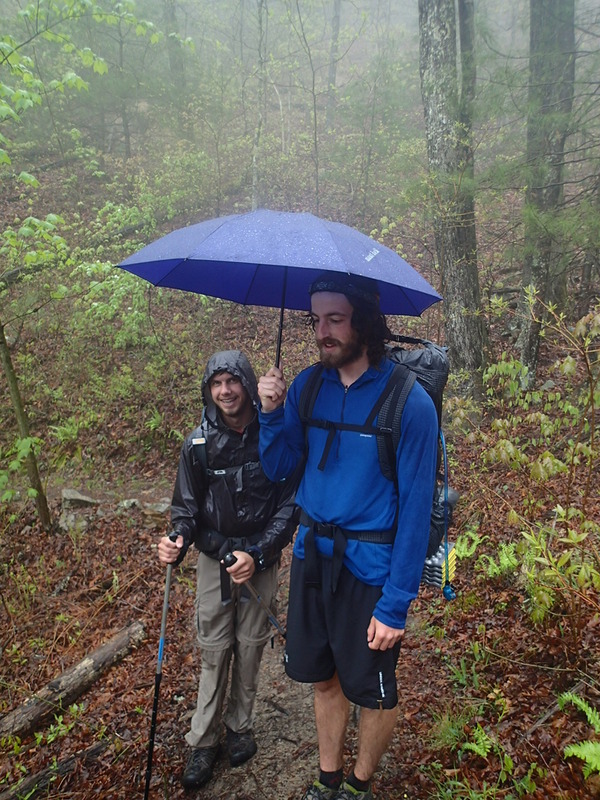 Favor Saver and his secret weapon, the hiking umbrella. This tent has been amazing, I can’t speak highly enough of it. It has done an admirable job in the rain, rain may splatter in some times but it doesn’t get condensation the way other tents do, the cuben fiber doesn’t sag when it gets wet, and it dries in a heart beat. 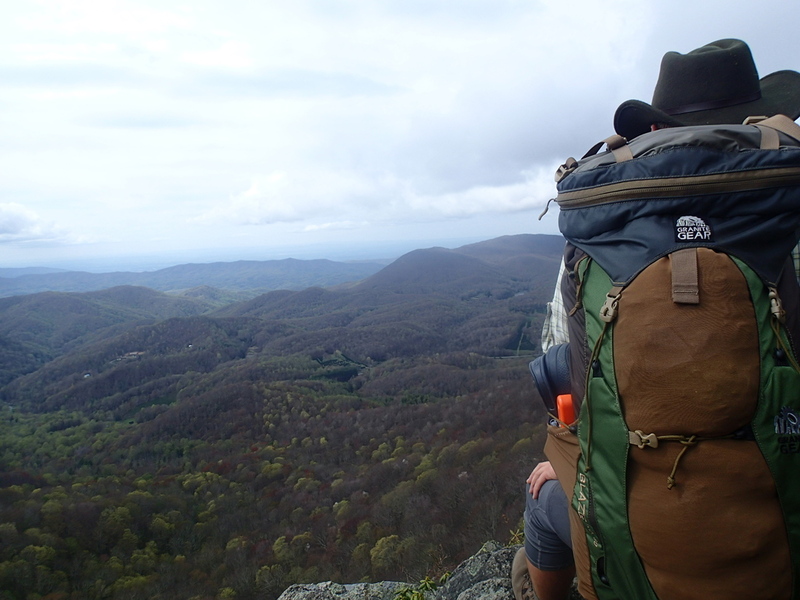 It has been really comfortable and the weight of it in our packs makes it completely worth it. After seeing a number of different tarp tents and brands out here I think I can safely say that if you can set this tent up well it is by far the best light weight tent on the market. We’ve made another few changes. 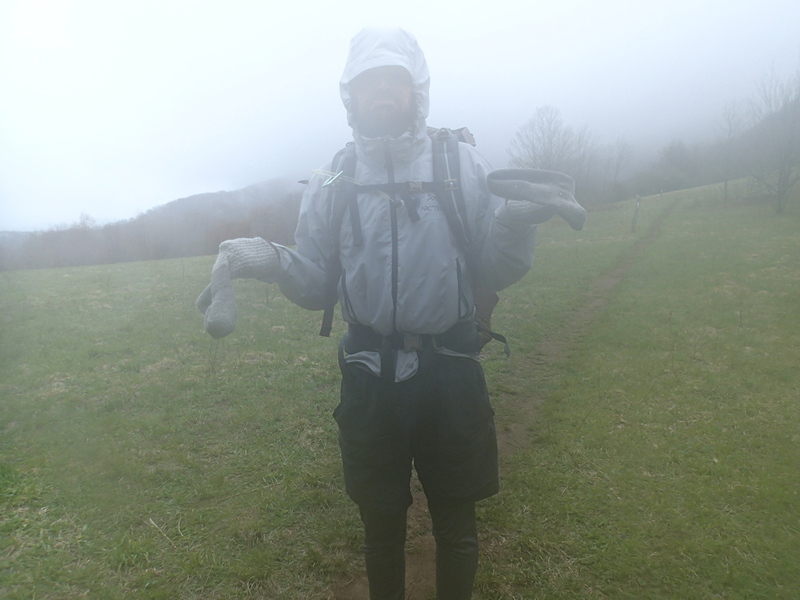 The two liter bag for our sawyer squeeze filter started leaking during the Smokies and it was all down hill from there. We bought a pack of new bags in Hot Springs and actually like the one liter bags better. We also put dots of some sort of water proofing gel on the bottom of our sleeping pads to try to give them some friction and keep them from sliding around the tent. Other then that everything has been great! Kyle and his Sloves (sock gloves). Thanks for the review of the Sawyer squeeze filter. I’m returning to the John Muir Trail this summer and was considering switching from my Katahdyn to the much lighter Sawyer. I’ll make sure to get the 1-liter bags instead of the 2-liter.